The village of Selborne in Hampshire is the home of the famed naturalist-curate Gilbert White. But between the south door of the church and the old yew tree, visitors will also see a stone marking the grave of Selborne's other legendary figure, 'The Trumpeter', John Newland who was supposed to have led the labourers to riot and overthrow their workhouse in 1830. 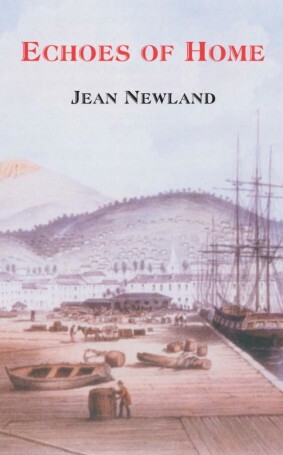 This book tells the story of one of his daughters, Ellen, who was transported to Tasmania eighteen years later. Includes a photograph of Ellen in old age. The first question most people ask me on hearing of my great-great-grandfather's involvement with the Selborne riots is, "Why wasn't he transported along with all the other participants?" A good question. For if, in fact, John Newland had really been the leader and organiser of the mob he would surely have suffered the same fate instead of getting off with a six-month prison sentence. The answer, of course, is that he was not the leader-not in the accepted sense of the word-but because he had a horn or bugle, most likely kept from his military service, he was persuaded to walk in front of the mob. It must have made the jeering, noisy throng look pretty impressive. I am sure he felt it the right thing to do at the time, because although he was a hard-working man, he had a large family to keep on very little money. In fact, the Newland family were paupers, most likely supplementing their living on hand-outs. I try to imagine what it must have been like for him after the fuss had all died down. With the other rioters sentenced and transported, how must he have felt then? I have to assume he kept rather quiet about it, and I'll tell you why. In 1976 a letter appeared in the Farnham Herald from a man living in Tasmania asking if there were any of the Newland family still living in the area. My father wrote to him and received an answer almost by return. It turned out that they were cousins. His father, my father's uncle George, had emigrated to Tasmania in 1898, settled well and had a family. Now they wanted to know the family history. Had great uncle George dropped a few hints I wonder? My parents, sister and I came to Selborne one day hoping the vicar would have the parish records to hand, but no such luck-they were by this time all at the Hampshire Record Office at Winchester. While we were in the village, though, we decided to visit the museum in the Wakes and found a reference to a John Newland, 'The Trumpeter,' allegedly the leader of the Selborne riots. Could this man be one of our ancestors, we wondered? My father was cautious, but a visit to the Record Office confirmed the line from John Newland through his son James to his son Frederick, my father's father. Now we knew the connection, but nothing more. And that was how it stayed for a while. My father died two years later, my mother's health declined, and sadly the correspondence with Tasmania petered out. Nothing more happened until 1993, when over lunch one day some colleagues and I were discussing our family backgrounds. Of course I proudly mentioned my link to Selborne and then, only a few days later, one of the ladies brought me in a copy of an Alton newspaper which had an article about someone having written a book (One Monday in November), and a play, about the Selborne riots. Well, this sounded interesting so I rang and booked a couple of seats for the play, This Bloody Crew. What a revelation! The myth of 'The Trumpeter' was exposed, but the story was fascinating nonetheless. And it was a strange feeling seeing your ancestors playing out events before your eyes, I can tell you. Publisher's note - The myth that the 'Trumpeter' was leader of the riot had been based largely on interviews which W H Hudson recorded with two daughters of John Newland early in the 20th century, and published in his book 'Hampshire Days.' In fact these daughters, Eliza and Harriet, had not been born at the time of the riot, and were passing on to him a family legend which appears to have grown with the telling! In the mid-nineteenth century men, women and even children were being transported to other British Colonies for crimes as diverse as stealing a loaf of bread and murder. In 1831, men from the village of Selborne in Hampshire were shipped off to Australia for their part in the Swing riots, and eighteen years later, in 1849, another resident followed. Ellen Heath was sentenced to death for attempting to poison her husband. This was reduced to transportation for life, but how harsh was her life to be, sent away with her baby daughter from family and the only life she knew? Front cover illustration - Hobart town from the new wharf c.1857. Back cover illustration - Washing trough in the memorial garden at the Women's Factory in Hobart, Tasmania.